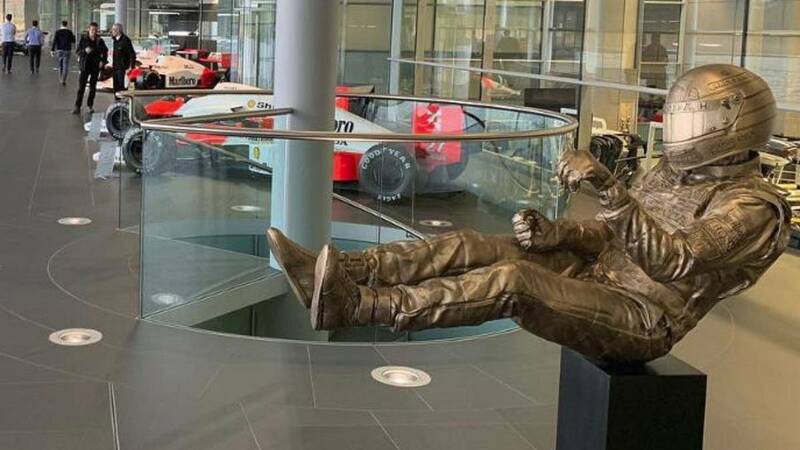 The team has installed in its headquarters a figure of the three-time champion, who will play alongside the team's historic single-seaters on a temporary basis. McLaren wanted to pay tribute to Ayrton Senna evoking what the three-time champion knew better: to drive. Through a real-size bronze sculpture and 160 kilos of weight that have been installed in Woking, the team has given the trajectory of one of the best pilots who have fought in their ranks with a piece that will look, temporarily, together to the historic single-seaters of the brand in Formula 1. Made to represent the triumphs and charisma of a driver who was not "designed to be second or third" but "to win", his author, Paul Oz, has reproduced the Brazilian on the Eau Rouge curve of the mythical layout of Spa-Francorchamps. The eight months of work of an artist who has made several works of art related to the great circus, have resulted in an emotive image of the three-time champion simulating his passage through that point in which he assured that he spoke with God. His author, tried "to capture the energy of that movement", and he succeeded. The sculpture simulates the Brazilian sitting with a monkey and a helmet inside the cockpit of his MP4 / 4 with which he competed during his passage through Formula 1 and commemorates the 25th anniversary of the death of Senna, who died during the Grand Prix of St. Marino in 1994.